So, it’s a sunny day and you’re having the time of your life driving on the road with the music turned up. What a nice experience indeed until you hear a thumping sound, realizing that your car’s air-conditioner is no longer working. The next thing you do is check the hood of your car at home, seeing a rubberized belt cut into half. Just so you know that is actually a serpentine belt. In these cases a serpentine belt diagrams would certainly come in handy. What Are Serpentine Belt Diagrams? A serpentine belt is like a computer motherboard. Without it, it is impossible to operate the engine components installed in your car such as the air-conditioning unit, water pump, steering pump, alternator, and so on. And just like a motherboard, it would seem kind of impossible to fix on your own due to its complexity. This is where serpentine belt diagrams come in. These diagrams will show you exactly where your belt fits in relative to the aforementioned parts. It gives you a comprehensive view as to where the pulleys are situated and how the belt should be routed over them. This basically enables a person, even without being a mechanic, the ability to do a serpentine belt replacement and keep your car going. Here’s a positive note about these diagrams: You can get them for free. You don’t really need to go to your automotive shop and spend money for it. All you need to do is look for serpentine belt routing diagrams online. This is very convenient because whenever you experience a breakdown in the middle of the road, you can simply log on to the web using your mobile device and download serpentine belt diagrams. Have someone bring you the proper belt and you can install it yourself and avoid a towing bill. There is never any certainty of what’s up ahead. Even your best days can be ruined when what’s beneath the hood of your car starts to mess up. But no need to worry, though; serpentine belt diagrams will turn you into an automotive doctor with no expense at all (well other than the cost of a belt). 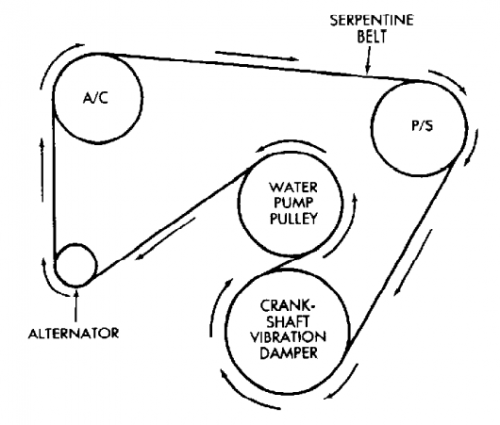 This website has a growing list of serpentine belt diagrams here. Dayco also offers an excellent guide which has diagrams for various makes and models. It can be found here. Looking for serpentine belt diagram for 06 Buick Lucerne Cxs. Looking for serpentine belt diagram for 2001 Ford courier 1.8 TD. No air conditioning. I’ve been looking for a belt diagram for my 1995 Toyota Avalon XLS and haven’t had any luck, could you possibly help? Looking for a diagram to install serpentine belt on 1991 S10 4.3 engine. Hi, I`ve been trying to find a routing diagram for my Dodge Journey R/T 2.0 diesel 2009…but without any luck. I need diagram for 2004 Suzuki aerio belt. Is then same as 2003? Hi, I have been trying to find a routing diagram for a 1998 Pontiac Grand Prix 3.8 L with supercharger and AC can you be of some assistance?